Allow us to welcome you, as our guests, on an exceptional hunting experience. As we enter our 19th year in business, one must reflect on the world-class waterfowl hunting and life long memories that have been created for our clients and ourselves. We thoroughly enjoy our guests and look forward to accommodating old friends, as well as some new faces next year. 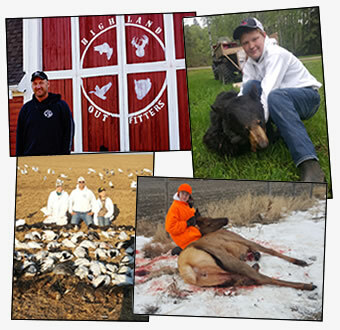 Please feel free to contact us at 1-866-453-9270 or by email, as we are always interested in hearing from fellow hunting enthusiasts. 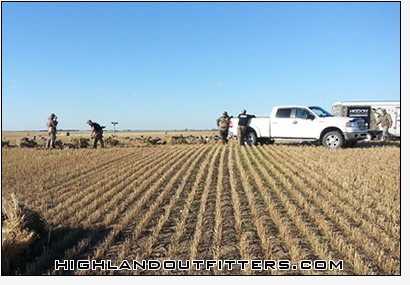 Goose hunting is done in harvested grain fields where we observed geese feeding in previous days. Geese that are abundant in our area are greater and lesser Canadas, White fronts (Speckle bellies), Snows, Blues, and Ross geese. This offers our clients some real variety and the chance to pursue what they prefer. Dark geese are usually hunted using full-body decoys from layout blinds for cover. This provides good up-close viewing and shooting access as well as safety for the hunters. White geese are usually hunted using 500 to 1000 windsock type decoys as well as full bodies with the help of an electronic call. We hunt wearing white suits amongst the decoys laying on inclined backrests, from layout blinds, or from a sitting position in our custom built A-frame blind with flip down front for easy shooting. 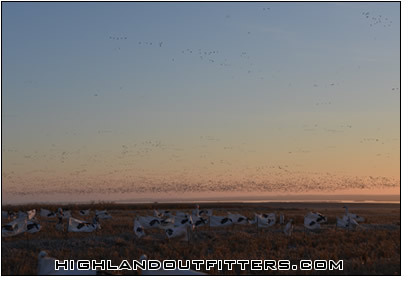 We usually shoot a lot of dark geese and ducks in the white decoys as well as they are accustomed to feeding together. Under the right conditions, pass shooting can also be very productive. Our outfitting area in West Central Saskatchewan consists of four wildlife management zones and lies amidst the Central Flyway in the heart of goose country. The area consists of over 10,000 square miles of lakes, river valleys, marshes, potholes, and grainfields providing excellent habitat for waterfowl. Some of the major staging grounds in our area include the South Saskatchewan River and Lake Diefenbaker as well as a few Ducks Unlimited projects and several other smaller yet often overlooked water bodies which play host to a large variety of waterfowl. We are fortunate to have long standing relationships with many of the landowners in our area which in turn provides access to the prime areas for our clients to hunt. The areas we hunt provide excellent hunting opportunities due to very limited hunting pressure and an over abundance of waterfowl and upland birds. Many past clients have complimented us on how well organized our operation is, which is something we try very hard to maintain. We take pride in how we treat our clients and strive to provide them with the personal service and attention required to have a memorable and fulfilling hunt. With friendly local guides who know the landowners and the area, you can be confident they’ll get you into the best shoots available. We go the extra mile and spare no effort to meet each clients needs during their hunt. Rest assured that all our resources are committed to your trip to ensure your expectations of a fully guided hunt in Saskatchewan are met or exceeded. We also use top quality equipment including reliable vehicles and newer decoys. If you have a specific request or preference, we’ll do whatever we can to fulfill it. Our service is what sets us apart from the rest. One group of six hunters is the most we will accommodate at one time. 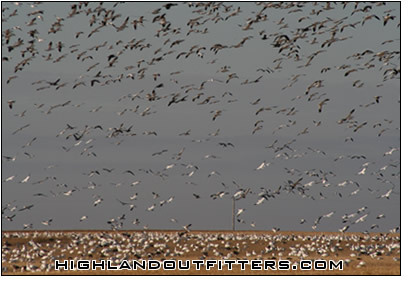 For seven years we took two groups of six at a time, and had a lot of success doing it with many clients returning year after year to hunt with Highland Outfitters. With our current camp format of only accommodating one group we have maintained the same sized spotting team we utilized when we hosted two groups at once. This means that your single group will enjoy the services of three guides with one in the field accompanying them during their hunt, and the other two spotting for their future hunts. We are not aware of any other camp in Saskatchewan that offers a spotting program comparable to this one for any price. By having more spotters on the road covering more ground, we have more options for which fields we hunt allowing us to be more selective with where we hunt each day based on wind forecasts, bird behaviour, etc.. This way when we have fields located that are looking good we can often wait to hunt them until conditions are more likely to produce a good shoot in that particular field. The end result is that you are always in the best possible field each day, thus increasing the odds of having more top quality hunts during your precious time here with us.